Get flexible and stay flexible. Each Yoga class will include warm-up movements; breath awareness practice to prepare each participant for Yoga postures; and meditation. Students are encouraged to proceed at their own level, with support for their individual abilities and limitations in an atmosphere free of competition and comparisons with others. In each session students are encouraged to pay attention to their own body in order to relax, focus and quiet the mind. Yoga postures can develop strength, tone muscles, increase range of motion in the joints and improve balance. An added bonus: the release of stress and tension. Drop-in students are welcome. No previous Yoga experience is necessary. All levels of Yoga practice, especially beginners to intermediates, will benefit from these classes. WHEN: Friday afternoons at 4:15 p.m.
Let me design a program that suits your individual needs, abilities, limitations and strengths. Hourly sessions at your place or my studio. Please contact me via email for rates and availability. For over 30 years i have practiced the art of Yoga movement and meditation. My life experience has shaped a gentle and encouraging approach to teaching Yoga. After undergoing a rigorous training process at Kripalu Center for Yoga in Lenox, MA, i received my certification as a Yoga Instructor in 2006 and have been teaching steadily since. My students include high school teachers, elders, young adults, teens, artists, as well as people recovering from physical pain and injuries. My goal is to make the practice of Yoga accessible to as wide an audience as possible, regardless of age, ability or experience and to expand each participant’s awareness of the mind and body’s resiliency. With my teaching method a Yoga student may learn to give up the struggle against one’s self and walk the path to acceptance, generosity and peace. A regular practice of relaxation training——not just on the day you’re feeling anxious——is particularly useful in managing stress, says Lasko. “If something stressful does occur, and it will, you’ll have the skills to deal with it,” he says. Try turning inward, suggests Miriam Hernandez, a certified yoga and meditation instructor based in Jeffersonville and Peekskill. 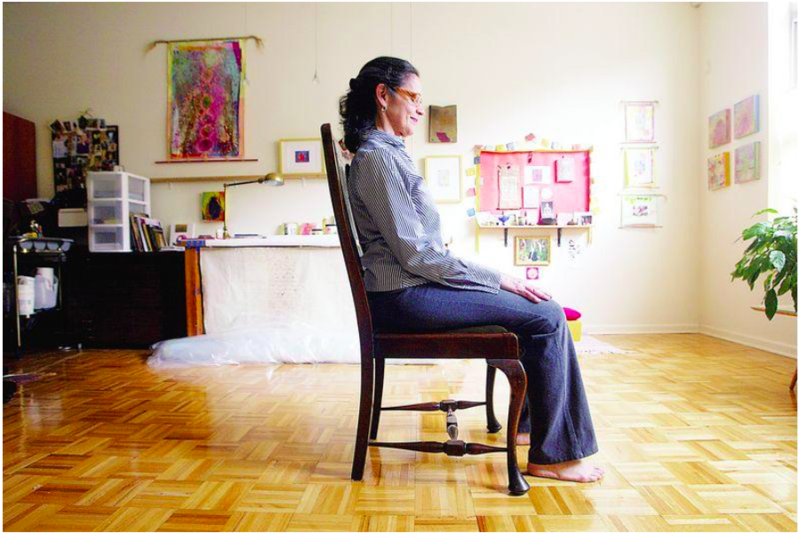 “Just sitting still and noticing your breathing can bring you back to yourself,” she says. People often have preconceptions about such calming practices as yoga and meditation, adds Hernandez, who teaches classes at the Jeffersonville Community Center and Fallsburg High School. “It doesn’t have to be about becoming one with the universe,” she says. “It’s about being present in your own life.”. . .
Read the entire article at www.recordonline.com. To find out more about yoga classes and private lessons please contact me via email by clicking here or writing to nuevayoga@gmail.com.